Granny Smith apples are so lovely for baking because they are dry and tart. They don't give off too much moisture during baking and under heat they become sweet and soft, but still hold their shape. I recommend using them for this recipe. I used a mandoline to slice my apples (which gives me pause because it is scary sharp!) but you can use a non-serrated knife. I set my mandolin blade at 3mm, which is plenty thin enough. In fact, I might go a little thicker next time. 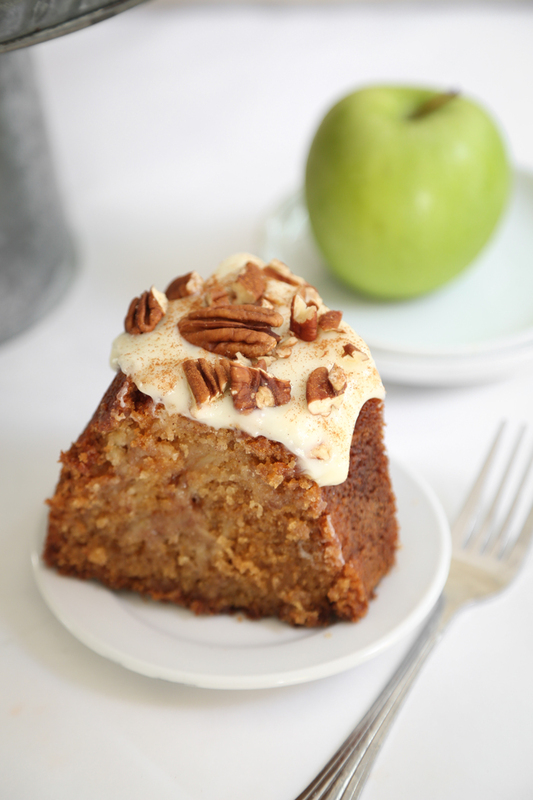 The apples are tossed with cinnamon-sugar and then alternately layered with the cake batter. This is a high sugar cake batter, and you'll notice when mixing it how thick and heavy it is. All of that sugar contributes to a deeply caramelized exterior. It's difficult to see the apple layers once the cake is sliced, but as your fork finds them they separate into delicate layers. It's so heavenly! Be sure to grease the pan well with flour-based baking spray. The cake batter has a lot of sugar in it to yield a deep caramelized exterior, but that also makes it prone to stick! Make the cake: Preheat oven to 350°F. Grease a 10-inch tube pan (or large bundt pan) with flour-based baking spray. Place flour, 2 cups of sugar and the next 7 ingredients in the order given in the bowl of an electric mixer. Beat at medium speed until well blended. Scrape down the bowl as needed and mix again. Combine the remaining 1/2 cup sugar and cinnamon in a large bowl; add the apples slices and toss to coat. Place 2 cups of cake batter in the bottom of the prepared pan. Layer half of the apples on top. Pour 1 1/2 cups batter on top of the apples. 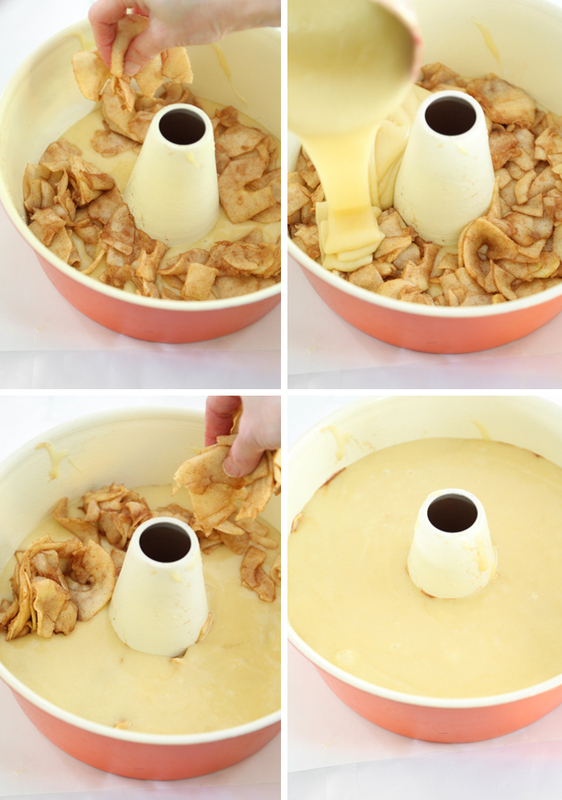 Layer the remaining apples over the batter. Pour the remaining batter on top of the apples. Bake for 1 hour, or until a toothpick tester inserted in the cake comes out clean. When the cake is done, turn out onto a wire rack to cool. Make the glaze: Combine the cream cheese and sugar in a large bowl and beat with an electric mixer until combined. Add milk or cream gradually until the mixture becomes thin (I used about 1/4 cup). 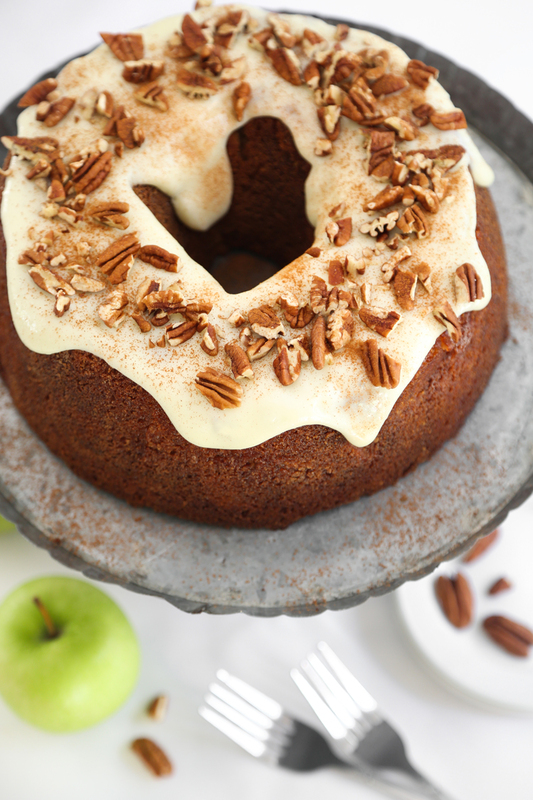 Pour the glaze over the cake and sprinkle with broken pecans. Store cake loosely covered with plastic wrap. Can this be made in a speingform pan? Don't have a suitable bundt pan but dying to try out the recipe. Looks delicious. Hi! Yes, I think it will work fine in a springform pan - just be sure to keep an eye on it as it bakes. If using a 9-inch springform, it will definitely need to be baked longer. 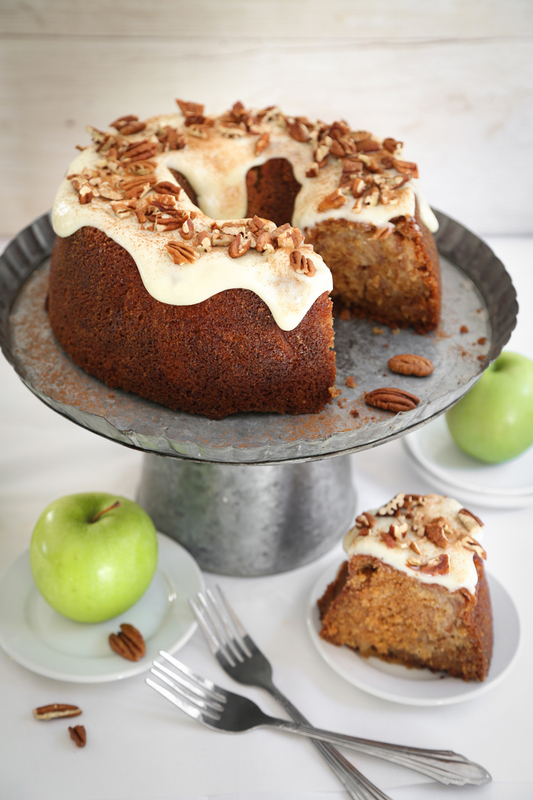 I love apples, and I like apple pie, but I have never cared for apple cake. I think I just don't like the big chunks of apples in the cake. 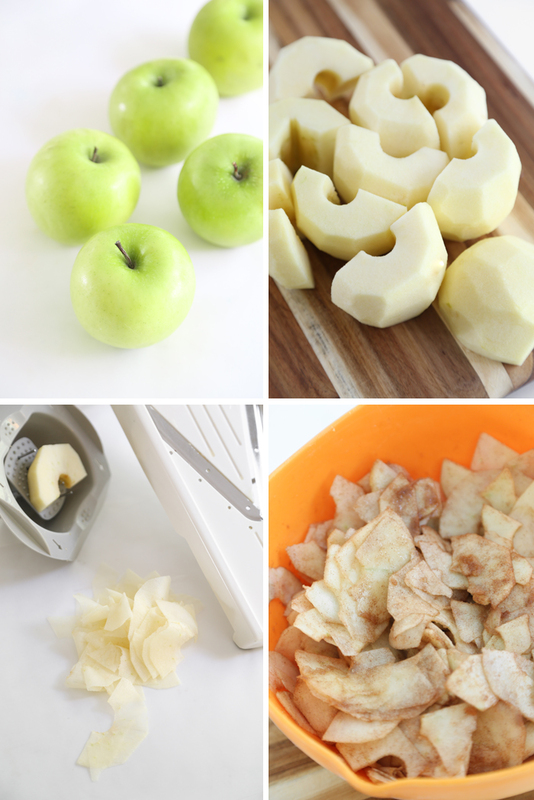 The thinly sliced apples in this recipe intrigue me. I may have to try it! Can you mix the apples into the batter instead of having them as a layer in the middle? Hi Catherine! Yes! I think that's a great idea. I recommend paying extra attention to thorougly greasing and flouring the pan (or using flour baking spray) because any apples that touch the edges of the pan will caramelize and be prone to stick. Just make sure you don't miss any spots. Thanks for asking! Thanks in advance. Love apples! Hi! Well, I only occasionally use a mandoline, so I'm feel I'm almost not qualified to answer this question. I have a very old Swissmar brand mandoline that does a great job when I use it. Pros: sharp as a mother-in-law's tongue, lots of blades including julienne. Cons: Plastic and bulky. Hard to store. The newer Swissmar models seem to be less bulky and have better storage options. I hope this helps a little! Ouch! A sore thumb is the worst! Most mandolines come with a safety food holder but it's so awkward to use. I often use my fingers (which is asking for trouble). I've heard about cut-proof gloves. Maybe that's a good option to look into. 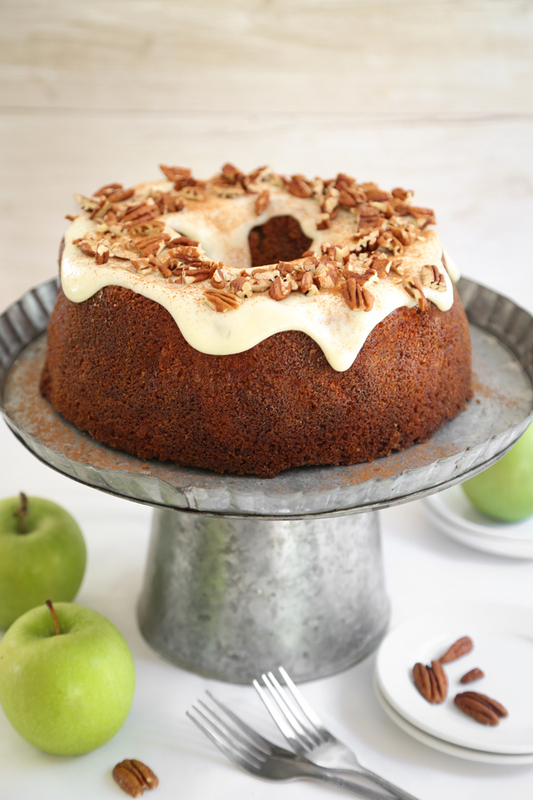 Good thing we're going apple picking this weekend because we NEED to make this! Yum! oooh, what a beautiful cake! I adore the idea of adding the thinly sliced apples in layers, I am stealing that idea although i'm petrified of a mandolin so mine may be a little chunkier! What a gorgeous cake! The photo makes us feel like we can touch it! Thanks for sharing this amazing recipe with us! Cake just went in the oven. I'm a bit worried though. The recipe calls for 2 cups (200 grams) of vegetable oil. According to my scales 200grams is only 1 cup of vegetable oil. I went with the smaller amount because 2 cups sounded like a huge amount. I hope I haven't messed it up. Will let you know how it comes out of the oven. I just back from the apple orchard and would like to have this cake for our Canadian Thanksgiving dinner on Saturday. I am strapped for time so was wondering if this would be OK baked in advance and then frozen until the day of the dinner? WOW!! This cakes is fabulous! It turned out great! Thank you so much!